Give your holiday packages a personal touch and get the kids involved, too! We have 8 different printable Christmas gift tags for kids to color just in time for gift wrapping. 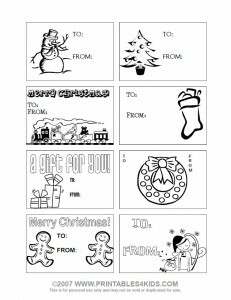 Click on image to view and print full size or download the Print and Color Gift Tags as a PDF file. Don’t miss our other fun printable Christmas activities. I started to wrap gifts this afternoon and realized that I forgot to purchase tags. Usually we make them, but we’re fighting illness this year and don’t have the energy for a full-scale gift tag assault So, just a note to say thank you for the free gift tags! I went to numerous sites and printed a dozen pages of tags (before I found your site) and NONE of them were satisfactory! Almost every single one was too low of resolution to be of good quality when printed, and many had silly or dated (in a bad way) images. Yours are high quality, classy and timeless – everyone on my list will have your tags on their gifts this Christmas! Used these last year and came back again for more this year. The kids love to color in the pictures. Thanks!